My kids are young (10 and 8 at time of writing), and so when I run D&D for them and their friends, I feel justified running my preferred iteration of the game: Basic D&D. It’s perfect for kids this age, for whom D&D is their first step into fantasy roleplaying games. A while ago a friend of mine (who is not a gamer) asked me if I would mind teaching her teenage son how to play D&D. Her teenage son plays a lot of computer games, so I assumed he has a good exposure to computer RPGs already. Of course, I agreed, and then started to ponder what version of the game I should teach him and his friends. 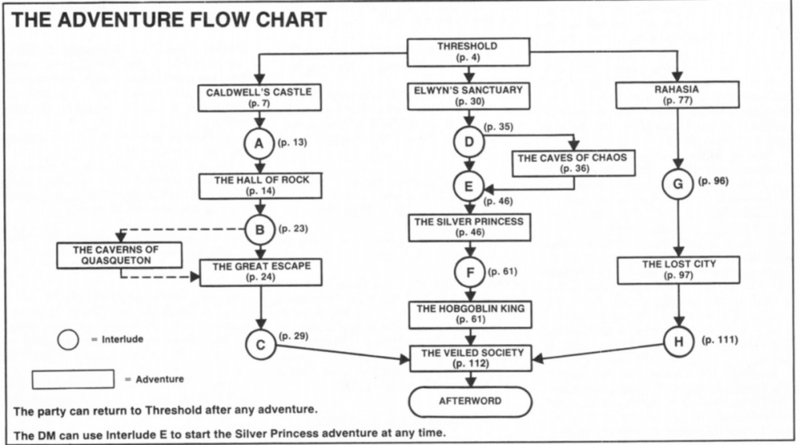 I love the OSR and TSR’s versions of Basic D&D. But when asked to teach the hobby to somebody else’s kid, a teenager who has a lot more experience with the genre (albeit through the video game world) than my own kids, I hesitated. 5th edition Dungeons & Dragons is either the most popular version of the game ever or the most popular since the early 1980s anyway. It’s the version of the game he has seen played online on Critical Role (maybe I should watch some of that to get an idea of what expectations he may have), and the version of the game that kids his age are going to play. The logic was inescapable – teaching 5th edition gives the best chance for this interest to turn into a long term hobby. The next decision to make was whether to use the D&D Starter Box or my own dungeon to introduce the game. I already bought the starter box for my friend to give her son, and I figured the beauty of that boxed set is that it is designed to teach the owner how to DM, not just how to play D&D themselves. I also figured that if and when he wants to DM, he will likely be running a game for the same friends who will be playing in my game. I’d like to leave him the option to run the starter box adventure for them. Miniatures add a visual element to the game. It is difficult for new players to keep the details of where every opponent is in combat in their head. This is why the 1991 starter box I have praised so much came with a complete set of fold-up paper minis and a large battlemat map. Mapping is tough for experienced players and is not really part of the “modern game” of D&D (since 3rd edition if not earlier). 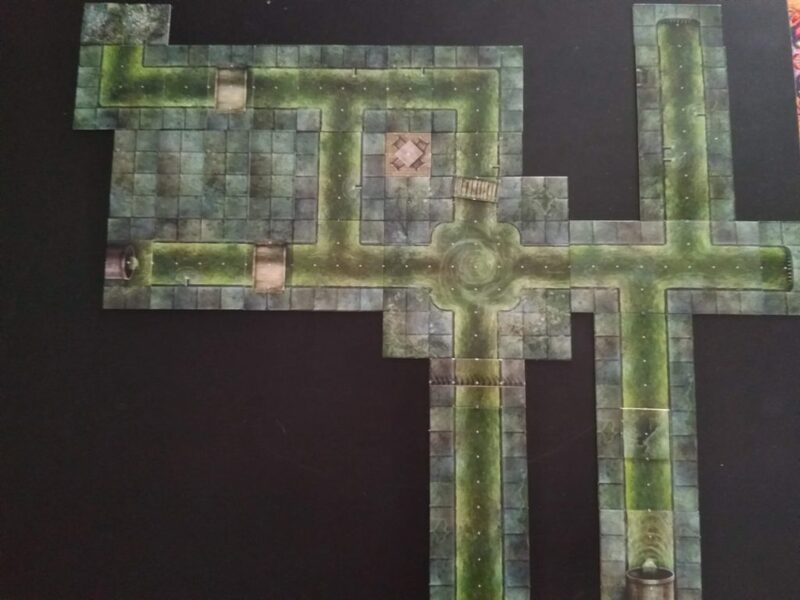 Using dungeon tiles will let me reveal the map progressively on the table, as if they are mapping the thing out themselves, without forcing the players to keep maps. Top down shot of the sewer dungeon I created for the game. During play, I revealed this map progressively. Falling (or jumping, or being thrown) into the sewerage provoked a Constitution save to avoid penalties to physical tasks and attacks. The miniatures seemed to be a big hit with several of the players, and were instrumental in convincing my friend’s daughter to join the game as well. As much as miniatures can seem “superfluous” to many experienced roleplayers, they were extremely important in “selling” D&D to the teens. Even though this was a one-shot, I gave out XP at the end of play. Several of the players, those who had relevant video gaming experience, were looking forward to XP and were happy to see how close they came to levelling up (it helped that characters need very little XP to reach level 2 in 5e). Honestly, if I was going to do things again, I may even have planned to have a break part-way through to distribute XP, and give out enough XP to let students reach level 2. I used a big variety of pre-gens – mostly from the WotC website but some generated using using Fast Character Maker. The pre-gens were selected to match the pre-painted miniatures I had available. I laid out the character sheets with the corresponding miniatures placed on top of each sheet on the table for the players to make their choices when they arrived. Again, this was about making the character selection visual. I also had a Player’s Handbook on hand and told the players that if they ran their own campaign in the future, they could create characters of their own with the rules in the book. The games are sorted above from most rules heavy to least. In truth, even Chivalry & Sorcery proper is not so much “rules heavy” as it is “complete”. There’s a lot of detail, but the rules themselves are not terribly complicated to use. Although the game has a distinct 90s feeling to the layout, all the tables and options and details make me enjoy thumbing through the books and think wistfully about playing. Almost all “serious” gamers I know have several games they have never played in their collection, in addition to several they will never play again. I’d really like to play C&S. While these books are currently in that “games I have never played” section of my collection, I’d really like to change that. It was hard coming up with regional traits and passions for most regions of the world, frankly. Pendragon’s “killer mechanic” is the personality trait system. In principle this should be great for A Song of Ice and Fire, however, I feel that most players would emphasize the “negative” traits (perhaps because of how salacious the Game of Thrones TV show is), and there would really be minimal social penalty and next to no “literary penalty” to doing so. The world of ASoIaF is more cynical than Arthur’s Britain. In play I suspect there would be less conflict between “positive” and “negative” traits and more simple indulgence of the negative traits. Pendragon also has a defined “downtime” in the Winter Phase. Each session should be 1 year of the campaign, speaking generally. This would mean the whole of the events from King Robert visiting Winterfell to now, for example, would take only a few sessions depending on whether you preferred the book’s pacing or the TV show’s pacing. Pendragon is about playing knights. You can also play ladies. There are more characters from more backgrounds than just those two in ASoIaF. The more I think about it, the more I think a Pendragon version of ASoIaF would be fun, but not particularly faithful to the source material, which would be one thing if it was D&D, but almost sacrilegious to do to a game so perfect for its source material as Pendragon. However, C&S seems to address these issues for me rather nicely! I can neatly side-step my difficulty in selecting regional traits etc by leaving those personality details up to the players, the personality trait system would not be present to be abused (replaced with some useful mechanics instead for influence), downtime is more flexible, and you can play any character from any social background. C&S also has a suitably low-key magic system (which would lend itself to tweaking to match the spell casting seen in ASoIaF), so I wouldn’t necessarily need to rule-out player character magicians as Pendragon 5th edition encourages. So maybe A Song of Ice and Fire is my best shot to find players to play Chivalry & Sorcery with me… we will see! This is an adventure location from my English Civil War Lamentations of the Flame Princess campaign. It is intended to take place in 1642, and uses the alignment system from England Upturn’d (which you can find on the blog of the module’s author, Barry Blatt, here: http://expanduniver.blogspot.com/2014/04/cavaliers-and-roundheads.html). Some spells from Vaginas Are Magic! are also included. Kingston-upon-Hull, or Hull, is a town build where the river Hull joins the Humber, in the East Riding of Yorkshire. Its population in 1642 was about 6000 people. On 23 April 1642, the Governor of Hull, Sir John Hotham, refused the King entry to the town, acting on the orders of Parliament to prevent the King from obtaining access to Hull’s arsenal. After fruitless negotiations, King Charles was forced to withdraw without entering the city. In July 1642, the King will lay siege to the town. Sir John Hotham, himself a Parliamentarian, estimates that Hull is 5/7 in favour of the King in the present dispute. The wealthy elite, however, embodied by the corporation, is Parliamentarian in its sympathies. The town is mostly moderate (non-separating) Puritan in its religious allegiance, although the previous vicar did succeed in a few “Laudian” projects, including beautifying the churches of St Mary and Holy Trinity. Sir John Hotham has been Governor of Hull once before, that time at the direction of the King. Parliament re-appointed him, and sent him with his son, Captain John Hotham, at the head of a troop of horse, to take control of the city and its defenses, to prevent the arsenal there from falling into the hands of the King. An old politician-soldier, he is regarded as untrustworthy and duplicitous in the finest tradition of politicians, and hard and heavy-handed in the finest tradition of soldiers. King Charles has pronounced him a traitor. John Hotham is an energetic cavalry commander, who fancies himself one of the more capable military officers in England, and believes that the coming war will give him a chance to prove it. He is held in higher esteem by Parliament than is his father, and keeps a close eye on his father’s activities in Hull. Their relationship has become strained by jealousy and distrust. Reverend Styles has recently been appointed as Vicar of Holy Trinity, having replaced the “Laudian” Reverend Richard Perrott, who died last year. He also holds the office of Lecturer, which comes with a generous wage. His appointment blocked the Archbishop of York from appointing another Laudian cleric. He has not yet removed the “popish idolatry” which Reverend Perrott had re-installed in Hull’s churches as part of the Laudian beautification project, but can nevertheless be relied upon for a zealous sermon in the finest Puritan tradition. The second Member of Parliament for Hull (the other member, Sir Henry Vane, is at this time in London serving as Treasurer of the Navy), Pelham is a former merchant and sheriff. Not a Royalist as such, but as mayor opposed Hotham refusing entry to the King. He was replaced as mayor, but is still part of the core group of aldermen who govern Hull. He resents Sir John Hotham. A former MP and Hull’s only Royalist Alderman, he was “invited to leave” the town shortly after Hotham refused entry to the King. Lord Digby is a hot-tempered English politician. He is well-educated and accomplished, and very good looking. These should be considerable advantages to a politician, and Lord Digby might make a very good politician if not for his emotional instability. A restless, dashing romantic, Lord Digby has been described by a former friend, the Earl of Clarendon, as “the only man I ever knew of such incomparable parts that was none the wiser for any experience or misfortune that befell him.” Perhaps for this reason, he fled the House of Lords in February just ahead of being arrested for treason by order of Parliament. After sailing to and from the Netherlands, he was captured on his return trip from York to the Queen (presently residing in the Dutch Republic). At this moment, Lord Digby is disguised as a humble French sailor, and is held prisoner at Castle Hull. At some point (ideally involving the PCs as intermediaries or witnesses), “Jacques” will tell his gaolers, in broken English, that he has some important information to tell the Governor, which will help Parliament. Not long after, he will be interrogated by the Governor, and will secretly reveal his true identity to Sir John Hotham, trusting Hotham not to reveal him further and hand him over to face Parliament’s charge of treason. A few days later, in a further interrogation, Lord Digby will negotiate the surrender of Hull with Hotham, securing Sir John’s agreement that if the King comes again before the town’s gates with a single regiment and fires a single shot against the walls, the Governor will consider his duty towards Parliament discharged and admit the King. Like so many of Lord Digby’s negotiated agreements, this won’t actually pan out, of course, but Sir John Hotham will subsequently allow him to escape and flee to the King at Beverly. Currently held prisoner in a comfortable castle cell, as befits a gentleman. He was taken prisoner on the same ship as Lord Digby aka Jacques Berruyer, but did not disguise himself. He will happily pay a reward (200sp) to any PC who facilitates his escape, and will add another 50sp if the PCs also affect the escape of his “loyal Frenchman”. If the PCs find out the Frenchman is really Lord Digby, who is wanted by Parliament, Colonel Ashburnham will increase the offered reward for helping both men to escape to a total of 500sp. Naturally, this payment cannot be made until both men are freed and able to escape to the King’s camp. Newly elected mayor for the second time (last having held the post in 1633), Thomas Raikes is an able administrator and well-respected member of the community. A relatively junior alderman from a wealthy merchant family, who lives near St Mary’s Church. He imports exotic goods from the continent (Amsterdam mostly) and sold Richard Fox the Malleus Deus, Tales of the Scarecrow, and the Sword which is Uncertain. Elizabeth Mawson is the last survivor of a coven of witches which operated in the East Riding of Yorkshire. When Yorkshire was beset by plague in the late 1630s, many blamed the onset of the dreadful disease on witches. Hull was devastated by the plague in 1637, during the previous term as governor of Sir John Hotham. Most of Elizabeth’s coven was caught up in the subsequent persecutions, and after being interrogated under torture, were tried and hanged to the jeers of townsfolk eager to be avenged for the loss of their loved ones to the plague. More information can be found in this hand-out. Elizabeth fled the town and has spent the last five years seeking the proper spells to help affect her revenge. Now that Sir John Hotham is back, so is she. Already in turmoil, having found itself the playing board for the opening moves of the English Civil War, wrought by political disunity, Hull has another enemy within its walls – a werewolf, or so assume the townsfolk. Almost every night, Elizabeth casts Howl of the Moon upon an unsuspecting man, who spends much of the rest of the evening running through the streets of Hull, howling at the moon and attacking people like a wild animal. When morning breaks, Elizabeth’s unwitting instrument has no knowledge of what he has done (although the blood on his hands and teeth should really be a strong indicator that they did something terrible), and the people of Hull find new victims lying dead in their streets. As I mentioned late last year, I have started running Basic D&D for kids (specifically, my kids, two of their friends, and one of their friend’s dad, who is a gamer too). The ages range from 8 to 11. We play in short sessions (approximately 2 hours), fortnightly. After our first 3 sessions, we just finished our first dungeon, The Sanctuary of Elwyn the Ardent as it appears in In Search of Adventure. I’m posting here a few of my “lessons learned”! I let anyone who rolled a 1 or a 2 on their hit die re-roll their hit points. I also didn’t declare characters dead at 0 hit points – instead, they just fell unconscious at this point, and if they could be healed at the end of the combat back to positive territory, they survived. Finally, I allowed characters on 0 hit points to recover 1d3 hit points after being successfully treated with a successful roll under the Intelligence of the character giving first aid (basically borrowing something like the Healing skill from Rules Cyclopedia). By the book (1991 Black Box Basic D&D), I should have done none of these things, but if I didn’t, nobody would have survived. Any character who is proficient with plate armour who can afford the measly 60gp it costs when they create their characters should buy it. Demihumans are all proficient with heavy armour. The few player characters who started with lighter armour despite their proficiency with plate instantly bought plate upon their return to Threshold at the end of the first dungeon. I’ll bear this in mind for future adventures! Does Old = Old School? When I think of old school play, I think of freedom, exploration, meaningful choices, and of course dangerous dungeons. The Sanctuary of Elwyn the Ardent ticks the last one of these, but as a dungeon it is entirely linear – it is just a spiral of rooms and connecting corridors, bringing the characters closer to Elwyn after funneling them through encounter after encounter. The main trap involves the party exploring a particular area which they will only explore if they find a treasure map showing them to explore that area. There’s no way really to get the treasure without falling into the trap, but it is not too deadly a trap anyway. The whole experience is very linear and there are not many meaningful choices for players to make. This is why the inclusion of so many monsters which can only be damaged by magic weapons is frustrating and simply has to be ignored by the referee – there is no way to avoid fighting most of these monsters! Most irritating of all, the module includes a number of secret doors on the map but tells you not to allow the party to detect them otherwise the dungeon will be anticlimactic. This is true, it would be anticlimactic, and it is easy to fudge failed rolls searching for secret doors if you are rolling behind a screen, since this is always a type of roll which the referee should be making anyway. But it just irritates me – I have players who created characters with the ability to detect secret doors and they are being cautious and searching for them. This is really the only element of player skill to the dungeon exploration component of such a linear dungeon, where even mapping is more or less redundant, but it’s completely nullified by needing to fudge the rolls. I ended up allowing the party to detect the secret doors when their rolls indicated they could, because it just felt wrong otherwise, but then I ruled the doors were locked and could only be opened from the inside, so they couldn’t short cut straight to the end, but I still found this deeply unsatisfying. The players, being kids, didn’t seem to mind too much though, they all had a lot of fun. There’s a lot of treasure to be found in this dungeon, and a lot of treasure in the way of rewards offered to the party by the Church of Karameikos. Even only giving XP for the former and not the latter, there was enough treasure for all 5 player characters to level up. The cleric even reached level 3 (oh, this reminds me of another way I broke the rules – I allowed the characters to level up during the dungeon since we played across three sessions). That’s a lot of gold they can spend back in Threshold! As mentioned in earlier blog posts, my Lamentations of the Flame Princess campaign is set during the English Civil War, starting as it did with the excellent England Upturn’d module published by LotFP by Barry Blatt. I thought I’d post here a collection of online resources which I have found very useful for my campaign. I hope it is useful and/or informative to people who might be interested in using the setting as the basis for their own campaign. Barry Blatt’s England Upturn’d is a great module and campaign resource for any English Civil War campaign. Even if you don’t intend to start your campaign with the adventure in this book, you should start your planning for an English Civil War campaign as the referee with this book. Its appendices alone are filled with great material about alignment, religion, equipment, etc. I happen to think that of all the LotFP modules published since the publisher decided to go with the “Early Modern” era setting, England Upturn’d does the best job of actually showing how to merge D&D into history. The Tower of the Stargazer by James Raggi IV (PDF from DriveThru via my affiliate link) can be incorporated too. I include it here because my own campaign was heavily influenced by it not because it is necessarily particularly English Civil War themed. Some of the other LotFP adventures may be “OK” as well, but I am unconvinced about their viability to be set in England in the early 17th century largely for religious grounds. For example, No Salvation for Witches seems to me to require a convent and nuns and is set in England in 1620, but these should be mutually incompatible from an historical perspective. Other modules which are not specifically set in early 17th Century England but which incorporate religious orders have the same issue. You might want to go with these modules anyway in your campaign depending on how much attention you’re paying to those details, or just modify the religious orders to something lower key to suit the Laudian Church of England. There are a good number of period maps available for free online which will look good at your table, whether it is virtual like mine, or physical. After England Upturn’d your players might want to travel north to Hull to witness the first (albeit abortive) military action of the Civil War. Cavaliers and Roundheads – I have it in paperback. It’s a good overview of the war. Civil War: The Wars of the Three Kingdoms – Another book, bigger and broader and covers Ireland and Scotland too, in case your campaign goes beyond England. I have developed some other things too which I am still working on and will post as they are completed. This brief post was inspired by Tenkar’s recent podcast about aging in AD&D 1e. Lamentations of the Flame Princess has aging rules (p35 of Rules & Magic) which kick in at middle age (40 for humans, 70 for halflings, 200 for dwarves). 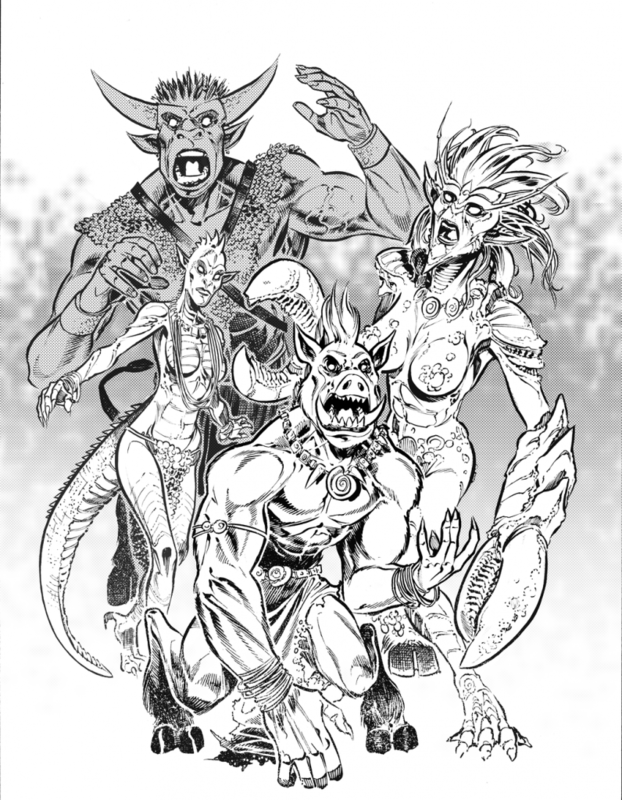 There are no rules given in LotFP for characters who have not yet reached the age of maturity. There are also no rules given for starting age in LotFP, so in our games we just assume that characters start as mature adults who are not yet middle-aged, and if it seems important for narrative reasons, we just specify the ages of our characters. I don’t think that there’s anything wrong with this approach, but sometimes you might want to play a younger character, and some players would rather roll a random starting age than to pick an arbitrary one (especially since this is a common part of character generation in many editions of D&D). The age thresholds for humans and halflings in the table on page 35 of LotFP correspond roughly to the age categories in AD&D 1e (p13 of the DMG). Dwarves do not correspond so directly (aging rolls start at 200 for dwarves in LotFP and middle age starts at 151 in AD&D), but a similar age range is covered at least. Despite subsequent LotFP publications pronouncing “this ain’t Tolkien”, Rules & Magic has Tolkien-like ageless elves. I’m therefore basing the age ranges here on a rough combination of these two tables. In general, rather than start with modified ability scores as per AD&D, Young Adult characters should start play at level 0, since they have not yet had an opportunity to train for their careers as adventurers. Level 0 characters do not gain experience points in the conventional sense. Instead, a level 0 character has to pass a narrative milestone determined by the referee which represents the character’s transition from “normal life” to a career as an adventurer. Characters who start play as level 0 Young Adults gain their first level in a character class upon reaching the age of maturity given in the table below, if they have not already gained it through achieving a narrative milestone. Humans reaching the age of maturity can choose between Cleric, Fighter, Magic-User, or Specialist. Demihumans advance in their demihuman class. When some of my gaming friends are asked what they emphasize as a referee, I often hear “the story” or something similar offered as a response. There is nothing wrong with this answer, of course, but I often wonder about it when it is given. I’d argue that most experienced referees emphasize “the story” at their table, but there are different forms of storytelling. The reason I say “player agency” and not “the story” is that I want the story told at my gaming table to be shaped by the players and to be significantly driven by their actions and decisions. It has been my observation, though, that some referees who say that they emphasize “the story” mean that they are prioritizing their story, the story arc in their head or in their adventure path. This is a very different form of storytelling to the one I personally prefer at the gaming table, which is emergent from the decisions and actions of the player characters. That is not to say that I cannot enjoy playing with a referee whose emphasis is on telling their story as opposed to player agency and emergent storytelling. If their story is crafted well-enough that I can’t tell that I am not having a meaningful impact upon how it unfolds as a player, then there is nothing wrong with the game at all. As players, we only tend to use the derogatory term railroad to describe this sort of game when the illusion is broken and we work out that we cannot meaningfully affect the story as it unfolds before us. I have sometimes seen this cast as an old-school vs. a “new school” dichotomy. I disagree, and the results of the OSR survey appear to bear me out. As recently discussed on Necropraxis, both OSR participants and non-OSR participants identify that they like emergent storytelling in their games. Both groups identify that they strongly dislike railroading, more than any other attribute of play mentioned in the survey. The principle difference between OSR participants and non-OSR participants shown in this latest analysis at Necropraxis is that non-OSR participants like balanced encounters and OSR participants do not. I could make an argument that balanced encounters de-emphasize player agency, since to exist, player agency in a campaign must mean that players could make decisions which lead to unbalanced encounters. However, I think this argument would miss the context of the question. As encounters by themselves, most players prefer balanced encounters – but to OSR players this term may be loaded with connotations of prescriptive tables and challenge rating formulae from 3rd Edition. I suspect that asking further questions around this point would reveal that non-OSR participants do not believe that the game world should be “scaled” to their level like the CRPG Skyrim, and that OSR participants do not believe that low-level parties should be thrown into combat with high-level monsters without some broader rationale based on the internal logic of the campaign. Let’s set aside the issue of balanced vs unbalanced encounters then. On the issue of emergent storytelling vs railroading, both old school and new school players are alike – they strongly prefer emergent storytelling over railroading. Somewhat surprisingly (at least to me), everyone, even OSR non-participants, seemed to be positive about Random encounters and Reaction rolls, which are mechanisms that weave juxtaposed outcomes into surprising sequence of fictional game events. This leads me to believe that positive attitude toward play designed to produce emergent (as opposed to planned) narrative is a broadly shared preference. It seems that Railroading, Alignment languages, and Dice fudging are universally disliked, with Railroading being solidly in full Dislike territory across all responses. In my recent Pendragon campaign game session, a new player commented on the apparent complexity of the Winter Phase. We are playing with the Book of the Estate and Book of the Entourage and some modifications based on the late Greg Stafford’s personal website and collectively, these sources add detail and verisimilitude to land and family management. Unfortunately they also add book-keeping and time, and are not always consistent with each other and with the core game itself. Frankly, there are some mechanics, especially around maintenance and estate budgets, which need to be simplified. However, when I go about this simplification, one thing I will not be doing is removing the random tables for childbirth, deaths in the family, strange family events, and so on. Why? Because these random tables drive emergent storytelling. The Great Pendragon Campaign lays out the major events of the campaign year by year, but the personal history of each player’s knight and their family emerges through play and to a very large extent through these Winter Phase tables, year on year. I feel like the analysis of the OSR survey results support this decision too, even though most of the players in my Pendragon campaign are non-OSR participants. The family and I have travelled home for Christmas to spend the holiday period with our friends and family. For the second year in a row, I’ve organised a big gaming get together with all of my old gaming buddies from back home as part of our holiday. Hopefully we’ll make it a tradition for many Christmas holidays to come! So the night before the night before Christmas (I write this on 23 December), I am preparing for the game. We will be playing Basic D&D, and the game I will be running will be a kids friendly game, with my kids joining and possibly one or two others. The adventure is one of my devising. Preparing for a one shot is very different from preparing for a campaign. The format has advantages and disadvantages. Fortunately for this game with old gaming buddies, I have more time than I typically do for a convention game. Rather than a tight four hour slot like at a typical con, we should be playing for at least six hours. I am sure this extra time will evaporate quickly, but I have some thoughts/ambitions about the game and my prep work is largely an exercise in cutting some things out and working on the details of the things which remain. First, the setting: a desert kingdom ruled by a snake cult, with vast temples erected by slave labour. The party members are escaped slaves who rebelled and escaped with whatever they could carry to the hills. The snake cult has paid the local tribes of firenewts to round up their escaped slaves to make examples of them to the slaves left to toil in their city, lest they too get ideas of rebellion and freedom. This is a handy way to have the player characters all know each other and share a common enemy and motivation. Let the players level up at least once. Fomorians are humanoids who live in the permafrost of the north of the Hollow Earth. Once they lived on the surface, and were the enemies of the elves, whom they fought for control of Ireland. Their leader, Balor, was slain, and most of their people was destroyed by the conquering elves. In order to preserve their species, the Engineers took the Fomorians into the Hollow Earth, settling them beneath Iceland in a land called Tech Duinn in elvish. Fomorians speak both elvish and their own tongue. They both hate and are irresistibly attracted to elves. Fomorians do not “breed true” – they mutate with each generation. The elven form is considered by most fomorians to be the most desirable and beautiful, and very rarely a fomorian will closely resemble an elf, but most fomorians are born with deformities and variations inexplicable to any conventional understanding of the principles of heredity. Human-sized parents can give birth to giant children, and giants can father children smaller than halflings. Fomorians and elves can interbreed, and the children of such unions tend to exhibit less deformities and more closely resemble the elven parent. The effect does not persist to the next generation, however. It is rare that fomorian/elven unions are formed by mutual consent, unfortunately, with most “beautiful” fomorian children born to elven parents dragged back to Tech Duinn in chains. The fate of such elves is generally grim and awful. Fomorians are extremely long-lived, although unlike elves, they are not immortal. If you are playing with the maximum age rules, a fomorian’s maximum age is 420 + 2d100. In their most “pure” form, fomorians resemble elves, although their skin pigmentations vary dramatically and without any indication of heredity. lmost all fomorians develop mutations in the womb and/or in childhood which distort this elf-like form. Fomorians born from fomorian/elven unions tend to develop fewer mutations than those with two fomorian parents (even if one of those parents was half-elven themselves). Unfortunately fomorians idealize elven standards of beauty, and most fomorians therefore detest their own appearance. Most fomorians will roll on one or both of the mutations tables several times. Some mutations can be rolled multiple times – where this is the case, it is marked in the tables. Other mutations can only be rolled once – if a fomorian rolls the same “once only” mutation twice, they should re-roll until they roll a different mutation. Based on the number of mutations a fomorian has, and their severity, one can classify them as a common fomorian or a beautiful fomorian. Such a distinction is artificial, of course, but nevertheless a useful abstraction to understand a fomorian’s place in fomorian society. A small proportion of fomorians mutate into giants. Irrespective of their birth, the enormous size and sheer physical power of these giants makes them high status individuals, especially in times of war. Even gigantism does not “breed true” in fomorians, however; two giant parents may have a child of ordinary size. Irrespective of the severity of mutations, fomorians possess an inate ability to identify other fomorians on sight, so a fomorian will never be so mutated that another fomorian does not recognize him or her as their kin. 1 Goat-head, with horns. Gain an additional horn attack for 1d6 damage. 11 Prehensile feet. Can use feet as hands. 2 Halfling-sized. Generate height and weight as per procedures for halflings. Cannot use large weapons, medium weapons must be used two-handed. 3 in 6 Stealth skill. 12 Stretched to be unnaturally tall for their frame. Double the base modifier when determining the fomorian’s height. Note, this can combine with halfling-sized. Can be rolled multiple times. 3 One leg. Base exploration speed becomes 60′, base combat speed 20′. 13 Fur. The fomorian’s whole body is covered in fur, usually of a colour which contrasts sharply to their skin colour. 4 One arm. Cannot use weapons which require two hands. 14 Tusks. Gain an additional gore attack for 1d6 damage. 5 One eye. No depth perception. -2 to missile attacks at short range, -4 at medium, -6 at long. 15 Hound’s snout and smell. +2 bonus to Search rolls for living (or recently deceased) targets. Increases to +3 against elves. 6 Bloated. Double the base modifier when determining the fomorian’s weight. Can be rolled multiple times. 16 Hardened skin. The fomorian’s skin becomes even more leathery. +1 natural Armour. Can be rolled multiple times. 7 Arms in wrong places. -2 to Dexterity ability score. Cannot throw. Can be rolled multiple times. 17 Over-muscled. The fomorian’s Strength is determined by rolling 1d6 and adding 12. 8 Bestial. The fomorian possesses an animal-like appearance and temperament. -2 to Charisma, +1 to Strength, +1 to Dexterity. Can be rolled multiple times. 18 Hunchback. Reduce height by 1d6 inches (1d3 inches if already halfling-sized). Can be rolled multiple times. 9 Poison bite. Gain an additional bite attack for 1d3 damage. Enemies taking damage from this attack must save against Poison to resist falling unconscious as if affected by the Sleep spell cast by the same level caster as the fomorian. 19 Oversized cranium. Hit die reduces from d8 to d6. Gain the ability to cast spells as an elf of the same level. Spells granted at random, one for each spell “slot”. Gains spells with each new slot. Each known spell is automatically prepared after 6 hours rest. 10 Tail. 3 in 6 Climb skill. 20 1d4 Minor Mutations. Can be rolled multiple times. 1 Unnaturally long tongue, which can extend up to 1d8 inches from the fomorian’s face. Can be rolled multiple times. 2 Elven magic. The fomorian gains the ability to cast magic as per an elf of the same level, in exactly the same way as an elf can. If combined with oversized cranium, the fomorian can additionally prepare spells (either those automatically known through the oversized cranium mutation or from a spellbook) up to the normal daily limits in addition to the spells automatically prepared thanks to oversized cranium. The number of spells the fomorian can cast per day, however, is unaffected. 3 Cat’s eyes. The fomorian gains infravision, the ability to see in the dark up to 60′. This is spoiled by the presence of light sources, which, if they exist in the fomorian’s field of view, restrict the fomorian to only being able to see what those light sources illuminate. 4 Elven reflexes. The fomorian is only surprised on a 1 in 6, as are elves. 5 Ultra fertile. If the fomorian falls pregnant or impregnates someone else, the resulting pregnancy will produce a litter of 1d8 fomorians. Can be rolled multiple times, each time giving an additional +1d8 offspring. 6 Unnaturally long fingers, giving the fomorian +1 to the Tinker skill. Can be rolled multiple times. Roll 2d6 for adult fomorians, 2d4 for young fomorians. Take this value as the modifier. For adult female common fomorians, height = 4’6″ + modifier“, and weight = 85 + ( modifier x 5 ) lbs. For adult male common fomorians, height = 5’0″ + modifier“, and weight = 120 + ( modifier x 5 ) lbs. For young female common fomorians, height = 4’6″ + modifier”, and weight = 70 + ( modifier x 5) lbs. For young male common fomorians, height = 4’8″ + modifier”, and weight = 85 + ( modifier x 5) lbs. The basic game statistics for common formorians of first level are given below. These can easily be “scaled up” by increasing the number of hit dice (and thus increasing the attack bonus and saving throws). For adult female beautiful fomorians, height = 4’5″ + modifier“, and weight = 80 + ( modifier x 3.5 ) lbs. For adult male beautiful fomorians, height = 4’5″ + modifier“, and weight = 85 + ( modifier x 3.5 ) lbs. For young female beautiful fomorians, height = 4’5″ + modifier”, and weight = 66 + ( modifier x 3.5) lbs. For young male beautiful fomorians, height = 4’3″ + modifier”, and weight = 70 + ( modifier x 3.5) lbs. The basic game statistics for beautiful formorians of first level are given below. These can easily be “scaled up” by increasing the number of hit dice (and thus increasing the attack bonus and saving throws). During adolescence, approximately 1 in 100 common fomorians experience a rapid acceleration in growth, and grow into a 13′ tall giant by the time of adulthood. Beyond this vastly accelerated growth, giant fomorians also experience additional mutations compared to their smaller kin. Their sheer size guarantees their status in fomorian society despite their deformities – giants are the most deadly weapons in any fomorian army. It is possible to create a fomorian player character. All such player characters are assumed to be common or so-called beautiful fomorians, rather than giants. All fomorians have a random skin tone, irrespective of the skin tone of their parents, ranging from “natural” skin tones as seen in humans, through to bright colours, blackest black, and albino white. Common fomorians start play with 1d3 Major Mutations. Beautiful fomorians start play with 1d6 – 3 Minor Mutations (negative number = no mutations). Fomorians with the oversized cranium or elven magic mutations (or both) progress using the experience points progression of elves. Beautiful fomorians without spell-casting ability progress using the experience points progression of specialists. Common fomorians without spell-casting ability progress using the experience points progression of fighters. Common fomorians gain +1d8 hit points per level up to level 9, after which they gain +2 hit points per level. Beautiful fomorians gain +1d6 hit points per level up to level 9, after which they gain +2 hit points per level. All fomorians have a minimum for 4 hit points (modified by Constitution) at level 1. Fomorians save as elves of the same level. Fomorians can use the press and defensive fighting options when fighting in melee. Common fomorians have a base Armour of 13, as opposed to 12. Beautiful fomorians have the regular base Armour of 12. And God said, Let vs make man in our Image, after our likenesse: and let them haue dominion ouer the fish of the sea, and ouer the foule of the aire, and ouer the cattell, and ouer all the earth, and ouer euery creeping thing that creepeth vpon the earth. So God created man in his owne Image, in the Image of God created hee him; male and female created hee them. MOST people are unaware that the World is home to other species of intelligent life beyond humankind, and has been home in the past to even more. Those learned people who have discovered the sometimes terrible truth that we are not alone have wondered that there is a similarity between the world’s intelligent species (at least those thus far discovered) which clearly differentiates them from beasts, beyond simply the faculty of language and the ability to use tools. All intelligent species outwardly resemble each other to at least some extent: they are possessed of two arms, two legs, a head, opposing fingers and thumbs, and broadly similar organs. The primary intelligent species of the world resemble each other so closely that we can call the non-human species “demihumans” to mark their very close resemblence. Humanity is the only species of intelligent life which inhabits the surface of the world in modern times. Although it is split into various races and nations, most starkly divided between Old World and New, all humans are much alike when considered against the other, less well-known peoples of the Hollow Earth. In its hubris, humankind fancies itself the master of the world, but only very few understand even the smallest part of the truth of this world, and one cannot be master of that which one does not understand. Most of the world’s intelligent life appears to have been created by the Engineers, an incredibly advanced race which disappeared from this orb untold millennia ago. It is possible that the similarities which exist between humans, dwarves, elves and halflings are due to a common creator. Perhaps the Engineers formed us all in their image, with only small deviations to differentiate us? The dwarves were created by the Engineers who built the Hollow Earth in the time before time. They were created as servitors to maintain the creation of their masters, but over the eons most of the truth of their origins has been forgotten, leaving existence bereft of meaning for most dwarves. There is nothing for most dwarves but work, endless work, as time allows chaos to encroach upon the perfect creation of the Engineers. Ironically the dwarves know too much; they know enough to know that what is most important to know has already been known and long since forgotten. This is their curse, the terrible knowledge which slowly murders their race, killing the joy of life, and with it the love between dwarves which leads to the birth of successive generations. Unlike the other inhabitants of the Hollow Earth, it is common knowledge amongst the dwarves that the world is hollow and that they live on the inside of it. The dwarves know that they are custodians of this hollow world for the Engineers. The Engineers are the closest things the dwarves have for gods, but they have been gone for millennia, and beyond a few artifacts and the world itself, the dwarves have nothing left of the Engineers. Access to the Great Archive of the Engineers was lost dozens of centuries ago, when the elves invaded the hollow earth by means of magic, occupying the island the elves now call Tír na nÓg, which had been forbidden to the races of the hollow earth, for it lay above the Great Archive. The dwarves fought to defend the Great Archive against these invaders, but since the Engineers had not created them with the ability to use magic, the dwarves were gradually pushed back by the elves. Eventually, the dwarves were forced to make a terrible decision – collapse the subterranean passages beneath Tír na nÓg on top of the fighting armies and in so doing cut off their only access to the Great Archive, or allow the invaders access to the forbidden knowledge of the Engineers. Their duty ingrained in their DNA, the dwarves protected the Great Archive even at the cost of losing their own access to it forever. Over the years the collective memory of the contents of the Great Archive has passed into dimly remembered mythology as successive generations of dwarves fail to pass on everything they remember to the generation which succeeds them. The dwarves know there are no gods, and that all the world is but a mechanism whose designers have long abandoned it, a mechanism whose maintenance is their responsibility, against whose inexorable decay their endless work is ultimately futile. The dwarves are spread almost everywhere through the Hollow Earth, unlike its other species, living mostly hidden from view between mountains, linked by a subterranean network of tunnels. The continents were once linked through such tunnels by high-speed transports and cables which carried communication signals across great distances, but after the dwarves lost access to the Great Archives they gradually lost the ability to maintain such high technology, and the great train and communication networks of the Engineers run through the veins of the earth no more. The dwarves do the best they can, travelling these tunnels to tend to the ancient mechanisms which maintain the world’s gravity (to both the inner and outer world), and filter its atmosphere, but these too are losing battles, for as the ancient machinery develops faults not encountered in generations, the dwarves can no longer consult the Great Archive to find the appropriate maintenance procedure. The dwarves are not just maintenance staff – they are also zoo keepers, charged with keeping the various civilizations of the hollow earth intact and more or less separate from each other. Here too they have not been as successful as once they were, finding it especially difficult to counteract the abilities of magic users since the Engineers, in their wisdom, designed the dwarves to be incapable of wielding magic (and thus incapable of challenging the supremacy of their now absent masters). Historically the dwarves have only directly confronted the inhabitants of the Hollow Earth when they have felt there was no other option – generally they prefer to work in the shadows to contrive to keep each species to the area assigned to it by the Engineers, or to at least prevent their further spread. When the sea monsters around Tír na nÓg proved inadequate to prevent the elves spreading to the surrounding islands, for example, the dwarves built fleets for the Fomorians, and gave them maps sufficient to navigate to Tír na nÓg and the new elven colonies, working through proxies where possible, hoping that the Fomorians would further dissuade the elves. The few dwarves who become adventures are those who throw off the malaise of the rest of the culture, and deny the doom of their people, determined to live in the world they know to be dying, and to enjoy it while they can. They are still hesitant to share the secrets of their people and the Hollow Earth with the non-dwarves they befriend, however, because to do so would break not only a deep-seated cultural taboo, but also every instinct written into their DNA by the Engineers in the time before time. The elves are creatures of Chaos, bathed in the arcane fires of magic. They once ruled the surface of the world, but retreated into the Hollow Earth through eldritch sorcery in the earliest days of humanity. The Tuatha Dé Danann, sometimes called sidhe, fairy folk, or elves in the mythology of those who dwell in our world, once inhabited Ireland before the arrival of the first humans, the Gaels. Having just been involved in a cataclysmic war with the Fomorians, the elves retreated to the Hollow Earth, which they call the Otherworld, rather than fight the human settlers. They have lived in the Otherworld for untold millennia and although they are ageless, few if any elves still live who can remember Ireland before the first men. The elves have many gods, chief amongst whom is the mother goddess Danu. Tuatha Dé Danann means “the peoples of the goddess Danu”. Once they reach adulthood, elves are effectively ageless, maintaining the appearance of eternal youth. For this reason the part of the Otherworld they call home is called Tír na nÓg, meaning “Land of Youth”. Elves have also settled on a few nearby islands, and there is some trade by sea between these colonies and Tír na nÓg, although elves prefer not to sail long distances due to the risk of sea monsters and Fomorian sea raiders. Although they left Ireland and the rest of the world of humans in the time before history, elves have often interacted with humans through magical means, which led to them becoming an integral part of the pre-Christian religion of the Irish. Many elven kings, queens and other leaders have become “gods” to the pre-Christian Gaels or figures in modern Irish folklore, although naturally many of the stories and depictions are distorted through their retelling over centuries. Amongst the elves, there are stories of elves who travelled from the Otherworld back to the world of humankind – none of them have ever been known to return. The elves live in Tír na nÓg with the Brownies, their halfling servants. Although long-lived, halflings do age and die. Most elven families have been served by halflings of the same lineage for centuries. Halflings do most of the housework, farming, gardening, and other manual labour, leaving the elves to pursue martial, cultural, spiritual and magical pursuits. Although generally peaceful, the elves are occasionally called to arms to defend their homes against the Fomorians and other residents of the Otherworld. Like the elves, the Fomorians once lived in Ireland, but were driven into the Otherworld or destroyed after the death of their warlord leader Balor. The Fomorians raid elven lands from the sea, taking slaves, looting, and destroying homes. These violent incursions recur frequently and stop the elves from sinking into total decadence. They also serve to thin out the numbers of the otherwise undying sidhe. The elves have also fought against other residents of the Otherworld, although far less frequently. In the earliest days of their time in the Otherworld, the elves fought a war with a race of short, gruff, bearded warriors who lived underneath the mountains of Tír na nÓg, who had been determined to drive the elves into the sea. Instead, thanks to their use of magic, the elves drove them from the surface and chased them into their subterranean lairs, and all that stopped them chasing their adversaries ever deeper beneath the surface of the earth was a massive collapse, triggered by the retreating enemy to stop further incursion, crushing what remained of their own armies as well as those of the elves. Halflings, or Brownies as they are sometimes called, live in the Hollow Earth, mostly in the elven homeland of Tír na nÓg. Most live as the servants of elven families. Since elves are immortal and halflings are not (living about one hundred years on average), it is common for halflings to serve the same elven master as their parents, and their grandparents and great-grandparents before them, going back many generations. They are not slaves, and are generally well-looked after by their elven masters, for if they would not, they would leave. They do not have their own language, and instead speak the tongue of their masters. They perform most of the manual labour for the elves, but are nevertheless characterized by elves as self-indulgent, because halflings spend their free time frivolously, in the judgement of elvenkind, eating, drinking, playing games, and generally being merry, instead of the “higher pursuits”‘ of the elves. Halflings generally have their own homes nearby the homes of their employers, and tend to be very house proud. In larger elven settlements, there tends to be a Brownie district, where the homes of all the halfling servants are found. All of the generations of a halfling family live under one roof. Generally speaking the adult males, unmarried females, and females whose children are grown will all work for the same elven master – it is rare that halflings from one household work for different elves. The roles they perform for the elves change over time, with older halflings generally employed in less physically demanding roles. Most halflings retire sometime in their nineties. Most halfling males will live in the same home for their entire life – the females will move only once, when they are married. Halflings like to say that the reason for their bare feet is that they don’t like to walk very far so they don’t need shoes – in reality their feet are naturally hard and insulated against the elements so as to render shoes redundant, but it does illustrate the halfling attitude about straying too far from home.